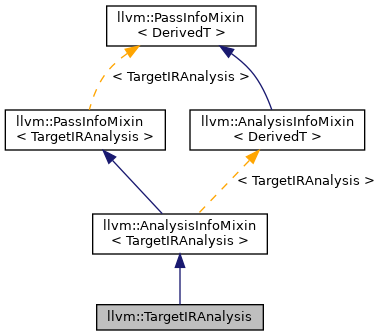 The core idea of the TargetIRAnalysis is to expose an interface through which LLVM targets can analyze and provide information about the middle end's target-independent IR. This supports use cases such as target-aware cost modeling of IR constructs. This is a function analysis because much of the cost modeling for targets is done in a subtarget specific way and LLVM supports compiling different functions targeting different subtargets in order to support runtime dispatch according to the observed subtarget. Definition at line 1674 of file TargetTransformInfo.h. Definition at line 1676 of file TargetTransformInfo.h. Default construct a target IR analysis. This will use the module's datalayout to construct a baseline conservative TTI result. Definition at line 1188 of file TargetTransformInfo.cpp. Construct an IR analysis pass around a target-provide callback. The callback will be called with a particular function for which the TTI is needed and must return a TTI object for that function. Definition at line 1190 of file TargetTransformInfo.cpp. Definition at line 1691 of file TargetTransformInfo.h. Definition at line 1693 of file TargetTransformInfo.h. Definition at line 1695 of file TargetTransformInfo.h. Definition at line 1699 of file TargetTransformInfo.h. Definition at line 1194 of file TargetTransformInfo.cpp. References F(), llvm::Module::getDataLayout(), llvm::GlobalValue::getParent(), llvm::TargetTransformInfoWrapperPass::ID, and INITIALIZE_PASS.